The New York skyline is made up of some of the world’s tallest skyscrapers. From the shores of the Hudson River, the buildings of New York City create an image like none other. Nestled among the modern and sleek facades is a collection of some of the most historic hotels in the world. Each lovingly restored to its former glory, the following hotels mix the best of days-gone-by with the modern amenities and services New York guests have come to expect when visiting the Big Apple. The Warwick New York Hotel, located on 65 West 54th Street, was built in 1926 by William Randolph Hearst. Built for his long-time love, actress Marion Davies, the Warwick quickly became a Manhattan icon known for its lavish accommodations and A-List guests. Some well-known regulars at the Warwick included such stars as the Beatles, Elvis Presley and long-time resident, Cary Grant. The Warwick has 426 guestrooms, including 67 suites. The hotel’s most recent renovation was completed in 2014 and features a palate of gray and champagne tones throughout the guest rooms and common areas. According to Hotel Online News, the renovation architect, Ellis-Carmody, worked hard to preserve the historic fixtures in the hotel by simply giving them a cosmetic upgrade. The Warwick is one of the most recognizable buildings in the historic and famous photo entitled Lunch Atop a Skyscraper. 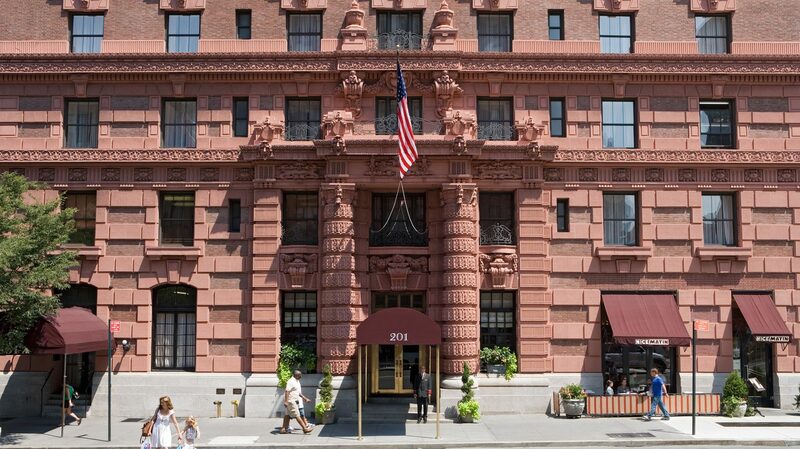 The Lucerne Hotel on 79th Street and Amsterdam is located in New York’s Upper West Side. This boutique hotel with 202 spacious rooms opened its doors in 1904. Designed by Mulliken and Moeller, the building features a reddish-brown façade that, due its heavy and thick construction, makes the exterior seem even more clay-like than other buildings of the same material. This welcoming hotel provides guests with a home-like feeling just a short walk or subway ride away from some of New York’s most exciting attractions. Both Central Park and the Natural History Museum are nearby, and visitors enjoy the European feel of the hotel and its surroundings. Newly renovated in 2008, each room features new tile and bathtubs as well as dark, wooden headboards and brocade blankets. This luxurious look compliments the high ceilings and elaborate window treatments. In July of 1899, on West 44th Street between Fifth and Sixth Avenues, the Iroquois Hotel was born. Set in the heart of Midtown, the Iroquois was designed by Harry Mulliken, part of the famous architectural team of Mulliken and Moeller. A unique combination of apartment homes with hotel services, the Iroquois quickly became a destination for those who owned homes outside of the city but wanted a place to stay for long-term visits to Manhattan. During the 1990s, the Iroquois underwent a major renovation where many of the apartment homes with larger living spaces were split into rooms more fitting of its new “hotel” status. A total of 117 luxury rooms are now available to guests. Along with the guest rooms, the lobby was also completely refurbished during the renovation and a fitness center and first-floor library were also added. 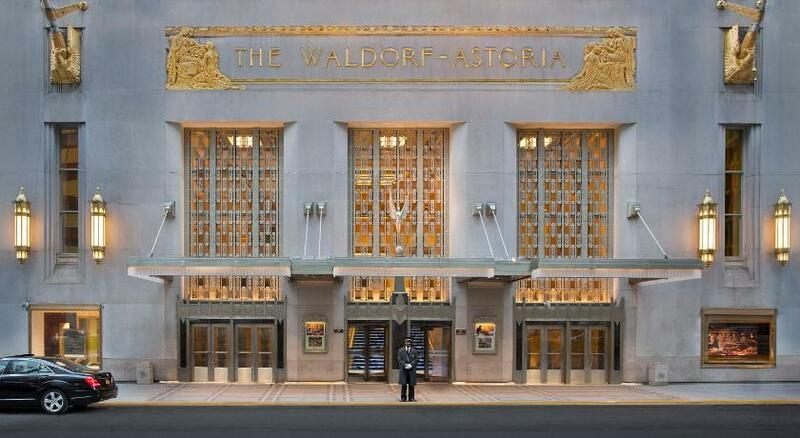 The original Waldorf Astoria Hotel was built in New York City in 1893 by millionaire, William Waldorf Astor. The 13-story building was the site of Astor’s own mansion located at the corner of 5th Avenue and 33rd Street, and was designed by the famous architect, Henry Hardenburgh. A short four years later, the Waldorf was joined by the Astoria, built on an adjacent sight by Astor’s cousin, John Jacob Astor IV. By 1919, both of the original owners of the Waldorf Astoria were deceased. William Waldorf Astor died on the Titanic, and John Jacob Astor died at his home in England. The original Waldorf Astoria was sold to developers in 1929 and would eventually become the site of the Empire State Building. In 1931, the new Waldorf Astoria opened its doors at its current location and immediately became the tallest and largest hotel in the entire world, even getting a nod from the then President Herbert Hoover in a radio broadcast. He called the hotel, “an exhibition of courage and confidence to the whole nation.” The Waldorf Astoria became part of the Hilton family of hotels when Conrad Hilton acquired the property in 1949. The Waldorf Astoria and the Towers of the Waldorf Astoria feature 1413 rooms, suites and private residences. The Plaza is one of the most celebrated hotels in America and opened for business on October 1, 1907. Also designed by famed architect Henry Hardenbergh, the hotel was built to resemble a French chateau. No expense was spared to make this the most lavish and opulent hotel in the world. The hotel originally served as a residence for the rich and famous of New York, Mr. and Mrs. Alfred Gwynne Vanderbilt were the first names listed on the register. The hotel has been featured in many movies throughout its history, and was the fictitious home of Eloise, one of its most famous young residents. Each of the 282 French-styled guest rooms and suites in this castle-like hotel has gold-plated fixtures and separate tubs and showers in the bathroom. The historic hotels found in the heart of New York tell the story of America like no other place in the world. Designed with rich architectural elements and attention to detail, these buildings are a testament to the vision and artistry of those responsible for their creation.